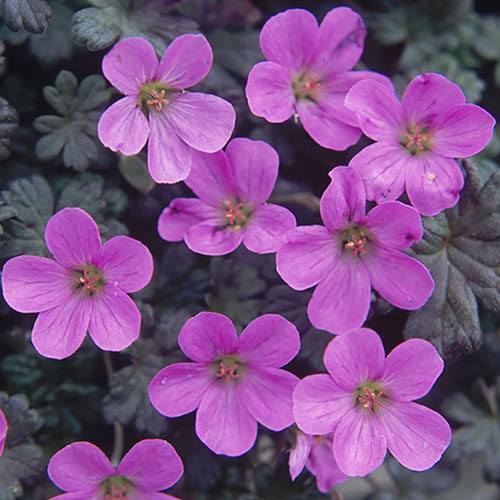 With a naturally spreading habit this hardy geranium is an ideal ground cover plant. Fully hardy, it will come back each year even bigger and better. The foliage is a very attractive deep green with bronzed margins and forms a low mound which is smothered in a carpet of bright pink blooms throughout summer. Bertie Crug is particularly lovely scrambling over a rockery or a low wall. Supplied as a pack of 3 premium jumbo plug plants, ready to plant straight in the garden. With a naturally spreading habit this hardy geranium is an ideal ground cover plant and is fully hardy so will last for years. The foliage is a very attractive deep green with bronzed margins and forms a low mound which is smothered in a carpet of bright pink blooms throughout summer. Bertie Crug is particularly lovely scrambling over a rockery or a low wall.